Eat Cheddar and cow's milk cheeses will never be the same with this unique Blueberry with wild thyme jam! ...read more. (4.23oz-120gr). This blueberry with wild thyme is a perfect pairing for Cheddar and all cow's milk cheese. Eat with a little piece of French Baguette and you will be in paradise! 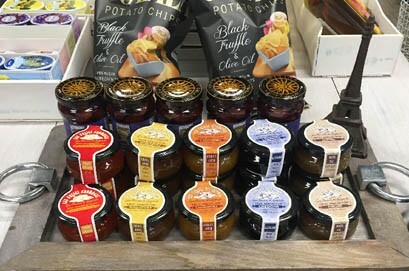 Those jams are made by the company Guillaume & Lesgards, set in one of the most beautiful valleys of the Pyrenees. The creation of these sweet surprises is a real work of art, as it requires the respect of the natural aroma of the fruit, a short cooking time to preserve its texture and colour, and a perfect balance in the association of flavours. 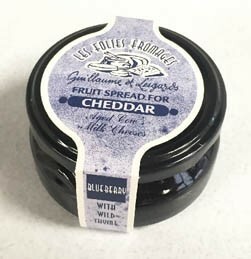 Les Folies Fromages are stunning fruit spreads to enjoy cheese like no-one ever did before ! Fruit and spices, combined with low sugar content, are the cornerstones of these recipes, specially designed to highlight the typical flavours of cheeses. The elaboration of each product was guided by a regional tradition.